The Apple Mac mini packs even more power, thanks to the latest dual-core and quad-core Intel processors. It also comes with integrated Intel HD Graphics 4000, Thunderbolt, USB 3, and OS X Mountain Lion--the latest release of the world's most advanced desktop operating system. The powerhouse Mac mini (view larger). Plenty of ports, including USB 3, HDMI, and Thunderbolt (view larger). This version of the Mac mini (model MD387LL/A) features a 2.5 GHz Intel Core i5 dual-core processor as well as 4 GB of RAM (expandable to 16 GB) and 500 GB of hard drive storage (see full specifications below). It also comes with the iLife software suite, which includes the latest versions of iPhoto, iMovie, and GarageBand. The Mac mini features a precisely constructed unibody enclosure that even houses its own integrated power supply into the 7.7-inch square aluminum enclosure (that's also 1.4 inches thin)--eliminating the need for an external power brick. Additionally, the Mac mini helps contain your environmental footprint with a 10 watt power consumption. Despite its smaller size, the Mac mini offers a full range of ports for connecting to your existing peripherals--from keyboards and mice to external hard drives and displays (via the Thunderbolt and HDMI ports). And when you're ready to add more memory, the Mac mini's bottom removable panel makes the upgrade process a breeze. Developed by Intel with collaboration from Apple, high-speed Thunderbolt I/O (input/output) technology delivers an amazing 10 gigabits per second of transfer speeds in both directions. Built into the Mac mini, the Thunderbolt port allows you to connect to new Thunderbolt-compatible peripherals as well as existing USB and FireWire peripherals using simple adapters. You'll be able to move data up to 20 times faster than with USB 2.0 and more than 12 times faster than with FireWire 800, and you can daisy-chain up to six high-speed devices without using a hub. Thunderbolt also supports DisplayPort for high resolution displays and works with existing adapters for HDMI, DVI, and VGA displays. With USB 3 built into the Mac mini, you can connect your external hard drive and transfer large files in seconds instead of minutes. Every Mac mini comes with four USB 3 ports--with speeds up to 10 times faster than USB 2--and you can connect all your USB-compatible devices, including your iPhone, iPad, iPod, or digital camera. Intel HD Graphics 4000 delivers up to 65 percent more pixel-pushing performance than the previous generation of integrated graphics. So the video you watch and the games you play are smoother and more responsive. Flipping through photo albums is a breeze. And you've got all the power you need to edit your HD video into a film worthy of a red carpet premiere. Just add your own display, keyboard, and mouse (display and peripherals not included; view larger). Note: The Mac mini does not come with an optical drive, however OS X Mountain Lion offers the convenient DVD or CD Sharing feature, which lets you wirelessly "borrow" the optical drive of a nearby Mac or PC. So you can install applications from a DVD or CD and have full access to an optical drive without having to carry one around. Additionally, you can connect an optional optical drive (such as the Apple USB SuperDrive) via one of the USB ports. 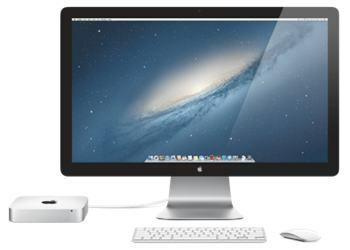 At the heart of every Mac mini--and every Mac--is OS X Mountain Lion, the world's most advanced desktop operating system. Since the software built into every Mac is created by the same company that makes the Mac, you get a fully integrated system in which everything works together perfectly. OS X works with the processor in your Mac to deliver the best possible performance. Power Nap even takes advantage of the Mac hardware to keep the entire system up to date while it sleeps. Incredibly thin and streamlined, the Apple Wireless Keyboard lets you type on your desk, on your lap, or anywhere within range. Wherever you put it, the keyboard will take up minimal space. Just like your Mac mini. Magic Mouse is unlike any other mouse you've ever used. The Multi-Touch surface lets you use gestures to swipe through photos and scroll down web pages. And the entire mouse is the button, so you can click anywhere. Magic Trackpad is the first Multi-Touch trackpad designed to work with your Mac desktop computer, and it supports a full set of gestures. Click, scroll, swipe, and rotate to control what's onscreen. Use it along with your mouse or as an alternative to one. Compact and convenient, the Apple USB SuperDrive connects to your Mac mini with a single USB cable and fits easily into a travel bag. It lets you install software and play and burn both CDs and DVDs, including double-layer DVDs.